With enhanced optics and a full complement of features, this projector boasts state-of-the-art 3000 lumen light output. The high/low lamp control adapts the projector light to either bright or dark rooms and extends the lamp life. The closed-head design keeps dust, dirt or foreign objects from damaging the precision focusing mirror and lens. A double fresnel lens assures sharpness and brightness and the large 11.25" x 11.25" stage glass lets you use a transparency sheet from edge-to-edge. The included lamp changer allows the user to replace the lamp and prevent delays due to lamp burn out. Also includes carry grips for easy transport and a security lock slot for theft prevention. Welcome to MyBinding Video. 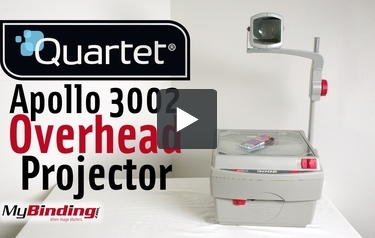 This is the Apollo 3002 Overhead Projector from Quartet. With enhanced optics and a full complement of features, this projector boasts an impressive 3000 lumen brightness, with superior clarity. To set up the projector, loosen the lock on the support arm, set the arm straight up, and tighten the lock. The mirror head will set down over the top of the arm, then use the knob to start the gear onto the track. The power switch is easily accessible, right on the front of the machine. There is a switch below the power switch to lower the brightness. The difference is subtle, but the lower brightness setting can save on bulb life. Included in the box is a pack of 4 overhead projector pens for use with transparency film. They have bold colored ink and easily wipe away from transparencies. The easiest way to focus the twin fresnel lenses is to place a transparency with text on it, and adjust the mirror head up and down until the image is the sharpest. No, this overhead projector doesn’t plug into a computer, but it is sturdy, well crafted, and affordable. For more videos and all your binding needs, visit MyBinding.com. Thank you for your question. The Apollo 3002 Light Gray Overhead Projector weighs approx 17 lbs. Thank you for your question. Unfortunately we do not carry any used machines. We do have a variety of clearance machines available. All of our currently available clearance machines can be found here . Can you hook this up to a computer for classrooms?